The girls in our after school care program are making the most of their after school time. They spent months hand making place mats, and they recently delivered them to the residents at the Arbutus Care Centre. It was a very rewarding experience for the girls. In addition to dropping off the 40 place mats, they visited and read with the residents. 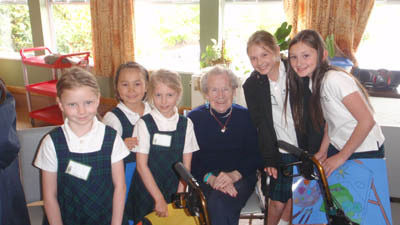 The girls got to see first hand how their work was appreciated and how their visit was a “bright spot” in the day for the residents at the care centre. The girls in After School Care have dubbed themselves “The Giving Girls” and are very much inspired to continue to do service work in the community. What a wonderful & caring idea….great work girls !